Cur-OST SA Pure is a low dose, high potency Curcumin & Boswellia based formula with vitamin C, CoQ10 and Flax to strictly promote a healthy inflammatory response in dogs! Benefits general discomfort from tendon, joint and overall body aches in your dog. Low dose formula ideal for large breed dogs! Cur-OST SA Pure is a low dose, high potency Curcumin & Boswellia based formula with vitamin C, CoQ10 and Flax to strictly promote a healthy inflammatory response in dogs! Benefits general discomfort from tendon, joint and overall body aches in your dog. Ideal for larger dogs due to low dose formulation! Our Cur-OST SA Pure formula combats critical levels of pain and inflammation while providing high levels of antioxidant support to aid in the management of several conditions affecting your pet. The only pet joint supplement on the market using potent levels of curcumin to combat high levels of chronic inflammation in a low dose formula. Inflammation is an ongoing problem, contributing to poor health, disease and poor performance. Most joint supplements on the market only replace what is being lost as a result of inflammation and do very little to curb the ongoing process. If we can manage inflammation more effectively, then not only is health restored, but joint function is improved. Often, we can reduce the usage of typical joint supplements due to our Cur-OST products balancing inflammation and minimizing tissue degradation. 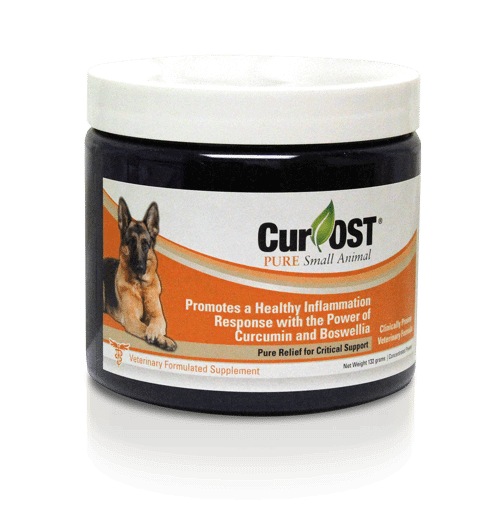 Cur-OST is the only supplement utilizing potent levels of curcumin to combat inflammation effectively and restore health in dogs! Our Cur-OST SA Pure joint pain supplement for dogs provides potent inflammation and pain reduction with antioxidant support in a LOW DOSE formula. Manage joint pain, back pain and knee pain more effectively and naturally by reducing chronic inflammation. Reduce the need to use traditional Glucosamine and Chondroitin joint supplements. Manage Chronic Inflammation at its SOURCE! Veterinary Formulated. Research Supported and Clinically utilized to get results for over 7 years! Curcumin : Research supported and clinically proven to combat inflammation and pain as well as provide secondary antioxidant support, primarily through down regulation of NF-kB and upregulation of NRF-2. Boswellia serrata 65%: Research support and clinically proven to reduce inflammation by impacting the 5-LOX pathway, which acts synergistically with curcumin for enhanced results. Reduce inflammation and pain by blocking enzyme pathways that are pro-inflammatory. Rebuild cartilage and connective tissue that has been lost by aging, injury and normal wear and tear due to inflammation. Restores lubrication and fluid to the joints, which may have been reduced to inflammation, helping to provide cushion as they move. A compound found in the spice turmeric, inhibits multiple inflammatory pathways in the body. It is also a potent antioxidant. Some of the benefits associated with Curcumin include immune system modulation, protection from oxidative stress, and support for the bodyÛªs natural anti-inflammatory response. The specialized extract, BCM-95®, in this formula has the highest absorption of any Curcumin extract available for the maximum health benefit. Curcumin has also shown benefits as a potent anti-oxidant, immune system modulator and provides protection against oxidative stress. It has also been shown to demonstrate potent anti-cancer properties. Curcumin’s biological activity is attributed to being both an anti-oxidant and anti-inflammatory, with both activities being complementary. Oxidative stress elicits an inflammatory response, so to be effective, the agent should quench free radicals as well as reduce inflammation. Most modern drugs fail to meet this standard and in most cases target to block COX-2, which is only a small piece of the inflammatory process. By blocking COX-2, there is then a reduction in the production of prostaglandin E2 (PGE-2) which is involved with pain signaling. All chronic diseases such as cardiovascular disease, cancer, diabetes, rheumatoid arthritis and Alzheimers have inflammation as a root component. COX-2 is also constitutively present in some tissues such as the brain and kidneys (2,3), as well as the gastrointestinal system (4). Thus, complete inhibition of COX-2 is not without possible negative consequences such as gastric ulceration and kidney damage. Most drugs exhibit a complete blockade or inhibition of a various pathways, which then impacts other pathways and leads to side effects. Curcumin does not exhibit complete blockade, but instead only down regulates the overactive pathway to basal or normal levels. Maslinska D, Kaliszek A, Operowska J et al, Constitutive Expression of Cyclooxygenase-2 in Developing Brain. A Charoid Plexus in Human Fetuses, Folia Neuropathol, 1999, 37; 287-91. Komhoff, M et al. Cyclooxygenase-2 Selective Inhibitors Impair Glomerulogenesis and Renal Cortical Development, Kidney Int, 2000, 57: 414-22. Kawai, S. Cyclooxygenase Selectivity and the Risk of Gastrointestinal Complications of Various Nonsteroidal Anti-Inflammatory Drugs: A Clinical Consideration. Inflamm Res, 1998, 47:S102-6. A fragrant tree found in the valleys of India. Its resin is used to make frankincense but it has also been used to promote joint health and proper inflammatory response for decades in humans. Boswellia also helps to control COX-2 which will ensure FAST long lasting effects. The special Boswellia extract found in Cur-OST has been standardized to contain 65% Boswellic acids. 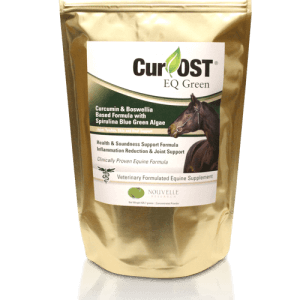 So with every dose of Cur-OST, you can feel confident that your pet or horse is getting the highest standard of Boswellia available. Ammon HP, Mack T, Singh GG, Safayhi H. Inhibition of leukotriene B4 formation in rat peritoneal neutrophils by an ethanolic extract of the gum resin exudate of Boswellia serrata. Planta Med, 1991; 57:203-207. Robertson RP. Arachidonic acid metabolites relevant to medicine. In: Braunwald E, Isselbacher KJ, Petersdorf RG, et al, eds. HarrisonÛªs Principles of Internal Medicine. 11th ed. New York , NY. McGraw-Hill: 1987:375. Reddy GK, Chandrakasan G , Dhar SC. Studies on the metabolism of glycosaminoglycans under the influence of new herbal anti-inflammatory agents. Biochem Pharmacol. 1989;38:3527-3534. What is the difference between Cur-OST and my pet’s joint supplement? Cur-OST formulas are designed to reduce inflammation and pain through the use of Curcumin and other anti-inflammatory herbs. Inflammation is an ongoing problem associated not only with joint deterioration but also many other health conditions. Most joint supplements contain glucosamine & chondroitin, which mainly target cartilage repair by providing nutrients lost as a result of chronic inflammation. They do provide a small amount of inflammation protection, but Curcumin is much stronger in its action and ability to reduce pain and inflammation. If you manage the inflammation and provide proper antioxidant therapy, often we find that glucosamine type supplements are not needed. That being said, those same supplements are perfectly safe to use with our Cur-OST formulas and may provide some additional benefit. Are the Cur-OST products safe for my pet? After 6 years of clinical development and utilization in our canine and feline patients, we have not encountered any side effects. In some cases, there may be noted an upset stomach or transient diarrhea which may be related to an inability to digest some of the herbs in the formulas. In most cases, this is transient, while in others, the dose may need to be reduced. Curcumin is one of the most heavily researched herbs for reduction of inflammation. One of the biggest reasons is that Curcumin impacts the inflammatory process on multiple levels instead of just one or two, like most pain medications. Curcumin inhibits negative cellular pathways, acts as an antioxidant and restores function to the entire body. Curcumin has also been shown to demonstrate potent anti-cancer properties and promote cardiovascular and neurological health, likely through reduction of inflammation. Plain and simple, it provides us with a new approach to managing pain and promoting health in our pets! Curcumin is the active phytochemical in Turmeric (Curcuma longa). The root of the Turmeric plant is the main component used and contains beneficial ingredients with medicinal value, but Curcumin is by far the most active. Most supplements utilize Turmeric, but Turmeric only contains 2-4% Curcumin on average. By using Curcumin instead of Turmeric, we can reduce our daily dosage and in most cases, obtain much higher health benefits. There has been much discussion about absorption and bioavailability of Curcumin in human studies, but our research has not shown this to be an issue. We utilize a patented Curcumin product called BCM-95, which combines the 95% Curcumin extract with volatile oils from the Turmeric root and based on research, this enhances absorption by up to 7x! BCM-95 Curcumin has also been shown to be more potent than Curcumin with added bioperine, demonstrating higher and more sustained blood levels. Curcumin is fat soluble, so the addition of these natural oils makes sense and simply works better! Do I need to continue my pet’s other supplements? 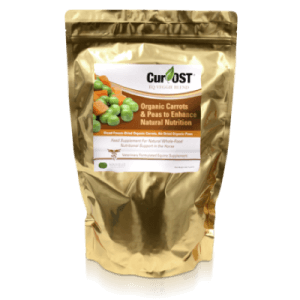 Our Cur-OST were designed to supply many nutrients, including vitamins and minerals in their natural form, which is the best form for the body to digest and assimilate. Most typical supplements and even some foods supply vitamins and minerals in their synthetic forms, which are hard to digest and absorb. The best form is from food or plants, which is what we target in our formulas. Many typical pet joint supplements utilize ingredients including glucosamine, chondroitin and MSM which are good, but only replace what is being lost as a result of ongoing inflammation. We find that if you effectively target inflammation and support cellular health, that these types of supplements are no longer needed, which saves you money in the long term. 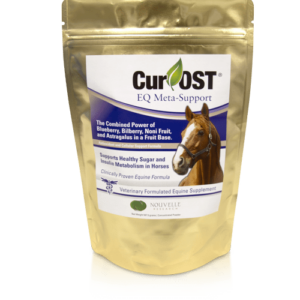 Our Cur-OST formulas provide potent levels of herbs and ingredients, often mimicking levels found in human and animal research studies, to give results clinically. Results, after all, is what you are looking for and we understand this. We don’t want to provide formulas with trace or non-functional amounts of herbs, but want to produce clinical results and restore health. We find that if we can restore health and manage inflammation effectively, then overall cost is actually reduced because your pet is healthier, stronger with potentially less visits to the veterinarian! Health can be restored and we are here to do just that! How is the Cur-OST SA product supplied and dosed? The Cur-OST formula for companion animals is supplied as a powder formula with a light hypoallergenic and gluten-free peanut butter flavor. The product is dosed at ÃÂ½ tsp per 10 lbs. once to twice daily, which is generally mixed with dry kibble, canned food, yogurt or other food mediums. In most cases, the product is well accepted. Are there any known interactions with prescription medications? We have not encountered any adverse interactions with prescription pain medications or other commonly used joint supplements, however, based on the mode of action of Cur-OST, it is recommended to use caution when administering with common prescription anti-inflammatories. Please consult your physician or veterinarian with any questions or concerns. How long with a container of Cur-OST last? The container will last the average 50 lb. dog approximately 30 days when dosed once daily. Cur-OST combines the proven anti-inflammatory properties of curcumin and boswellia alongside many powerful nutritive herbs to help combat pain and inflammation. Curcumin and boswellia have been researched for decades and have been show to exhibit similar properties to many common prescription pain medications, but without the side effects. Our Cur-OST products were developed out of our veterinary hospital to help reduce pain, improve mobility and quality of life for our veterinary.